India’s biggest cab-hailing company Ola recently made a debut with a fleet of Bajaj and Piaggio autorickshaws in Liverpool with an goal to compete Uber as the region’s top taxi-app. Passengers enjoyed tuk-tuk rides free of charge on the first day of the launch. Managing Director of cab-hailing giant Ola Ben Legg had an interesting day at work last week when drove people around the city of Liverpool behind the wheel of a Bajaj Re autorickshaw. 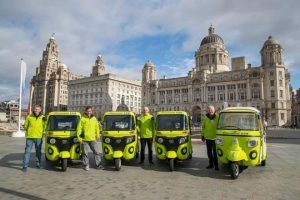 The taxi-app recently launched a fleet of Bajaj and Piaggio autorickshaws in Liverpool with an aim to overtake Uber as the region’s top ride-hailing firm. People around the city saw brightly painted tuk-tuks with drivers wearing neon green jackets ferry passengers around. To celebrate its entry in the region, the Indian leading startup offered rides free of charge around the Liverpool City Centre. While Ola is expanding massively with a mission to challenge Uber on a global level, it has said that its fleets of autorickshaws will allow more choice to the customers and pay a larger share of the fare to the drivers compared to Uber. Ola’s recent entyrentry in Merseyside includes 50 percent discount for customers who download the application before the end of April, 2019. As part of its pledge to empower drivers, Ola says it offers the highest driver rates, charging 10% commission to black cabs, compared with 25% charged by competitors. Ola was first launched in the United Kingdom in Cardiff, Wales in August 2018, followed by a launch in Bristol in October and then in Bath and Exeter in November. The launch Liverpool is the fifth for Ola’s UK and the start of its expansion in the North of England this year.